First off, Happy New Year! I have been unmotivated by the prospect of doing blog posts without photos go along with them. I think the blog entry recession is over now that I've picked up a Canon 7D Mark II. I've had the camera for nearly a week now and I've been able to take it out for a few sessions. My first trial run was on Saturday, but it was pretty unsatisfying. The weather was dull and moments of drizzle came and went. 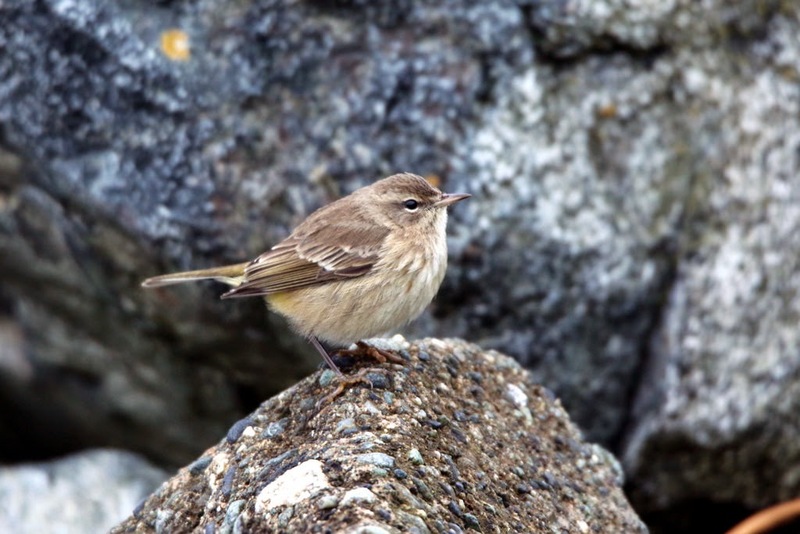 My favourite shots of the day were had on the rocks at Cattle Point. The first day I had it out was on Sunday when I joined Ian Cruickshank for a bit of alley exploring in the Uplands. The alley birding was pretty interesting, but we couldn't drum up anything unusual. In fact, despite toting the camera in my backpack for nearly three hours, I wasn't even tempted to take it out. I did finally pull out the new rig at the end of the day. We decided to stop in at Clover Point where we bumped into Geoffrey and David Newell. I asked if they'd seen anything of interest, but it was just the usual suspects. 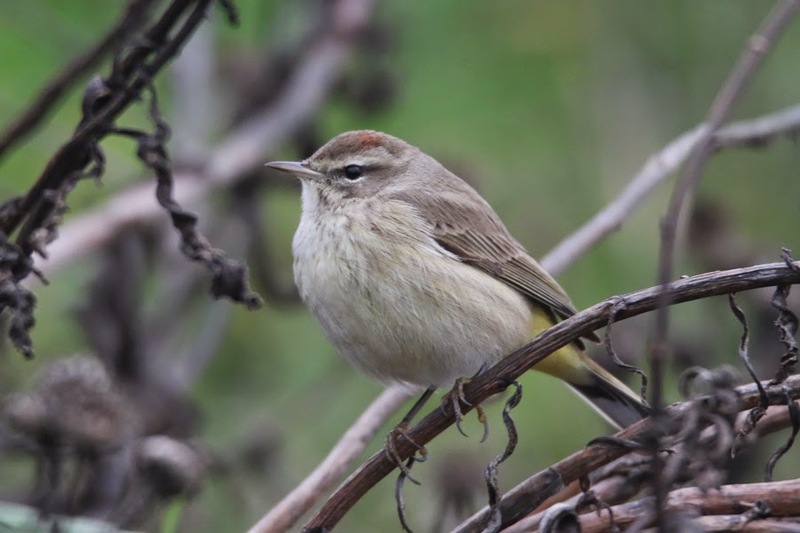 Still, I prodded them to know whether they happened to come across the Palm Warblers. They indicated they had not, so I asked if they had walked around the tip of the point along the beach. They had not. 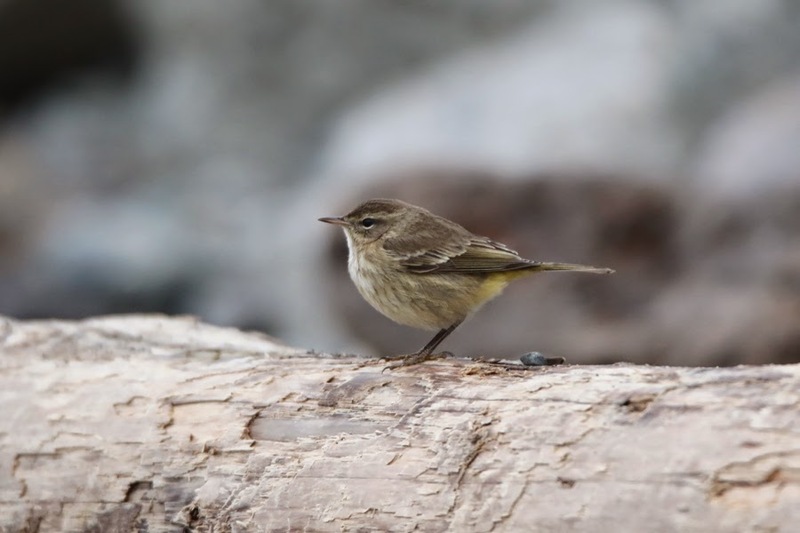 When I found the first Palm Warbler at Clover Point back in mid-November, I was standing right at the tip and it flew below me. With this thought, I stared down at the beach and caught the movement of a bird out near some logs. 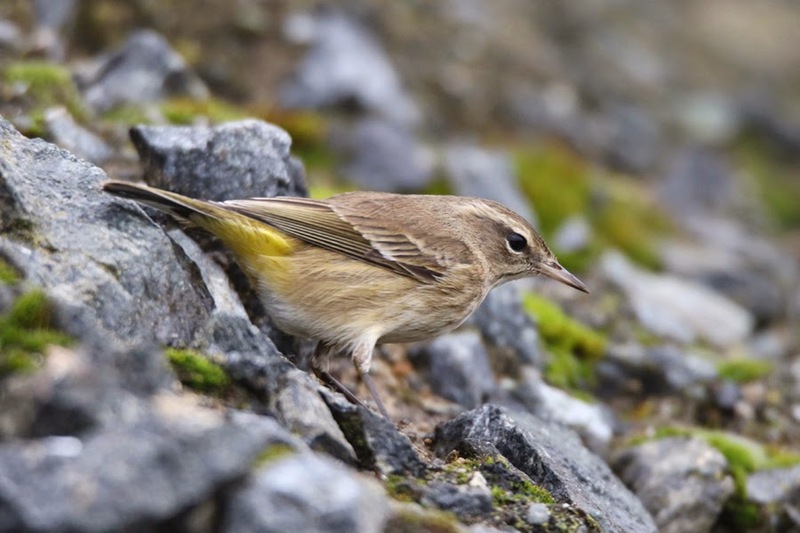 I raised my binoculars, soaked in some details, and was able to proclaim "There's a Palm Warbler down there!" Ian and the Newells were equally elated. After watching them for a minute, I decided I would put my 7D Mark II to its first test. How would it perform in the dull, late day light? It was already around 4 p.m. and I knew any photos would come out noisy. Still, I had heard this camera has great high ISO capabilities. I don't like to drop my ISO below 800, so I decided to see what I could at that setting. My photos came out really cold and drab, but a little editing made the results look not too bad. It was a nice first test, but it left me realizing there is a lot to learn on the camera. I was able to head out again the next afternoon because I was itching to try some different settings in better light. 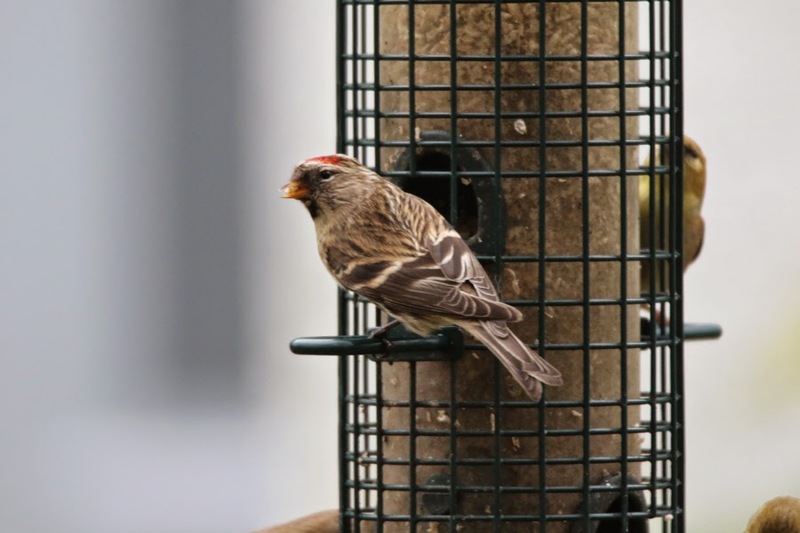 There was a report of a Common Redpoll on January 5th from some feeders near the intersection of Southgate and Quadra Sts., but all subsequent efforts to relocate it came up empty. I arrived at the feeders just before 2:30 p.m. and amazingly enough found the Common Redpoll in a few minutes. 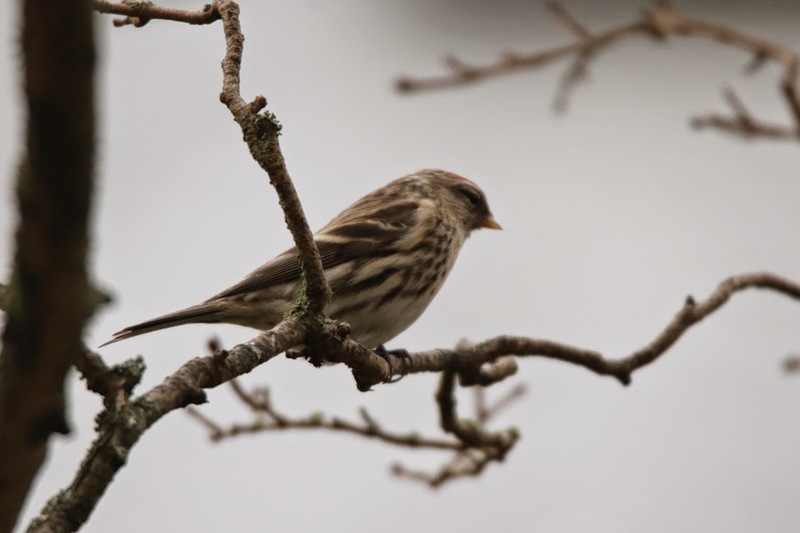 It was a distant and somewhat brief look, but I knew it was the redpoll. I posted a message on BCVIBIRDS and continued to watch the feeders. Mary Robichaud arrived in good time and I left her to watch the feeders while I patrolled the road to the north. From Southgate St. I could see a few Cedar Waxwings, so I wanted to get a closer look to ensure my much sought after Bohemian Waxwing wasn't in the mix. I spent ten minutes or so dividing my attention between a berry-rich holly shrub on the St. Ann's Academy property and a birch on Academy Close. After feeling I had given that a fair scouring, I rejoined Mary back at the feeders. A good five minutes later, the Common Redpoll mysteriously materialized at one of the feeders. I made sure Mary had seen all the features before making an approach with my camera. Getting a decent photo was tricky because the feeder wasn't stationary. 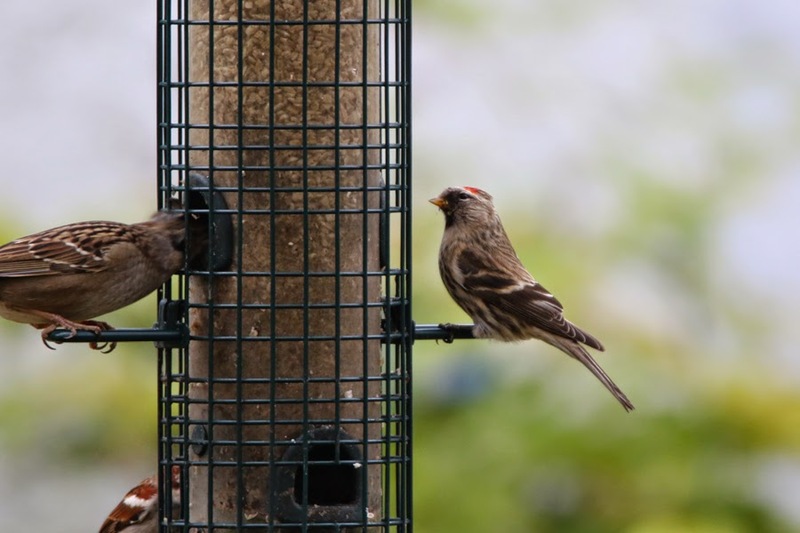 It was rotating as new birds landed on the feeder, causing the redpoll to vanish in and out of view. When the redpoll decided to fly up to the top of the oak, both Mary and I had seen enough to be content with the sighting. We head back to our vehicles and I noticed a gull across the road. It actually appeared to be somewhat pale compared to the handful of Glaucous-winged and "Olympic" Gulls nearby, so I actually thought it might be Ring-billed. The size wasn't right for Ring-billed, so I headed over to get some photos and Mary departed. The gull allowed close approach and I managed to get some decent photos. The pigeon-headed look, small bill, and pink legs pegged it as a Thayer's Gull. The age on this bird is the tricky part. 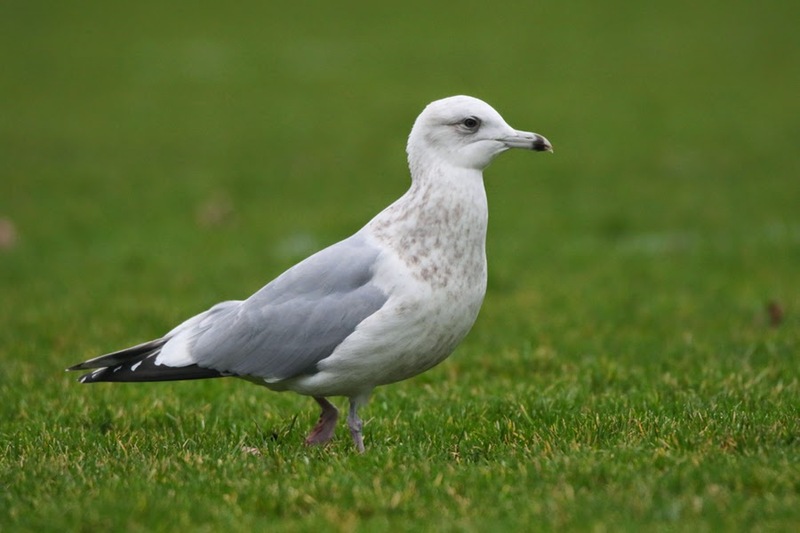 I thought it might be a fourth-winter bird, but when I put it up on the North American Gulls page most suggested third-cycle. Note the switch in terminology - many subscribe to the use of cycles for aging, but I am more used to referencing the season. From my understanding, a third-cycle bird would be in its third winter so I might be a year off. 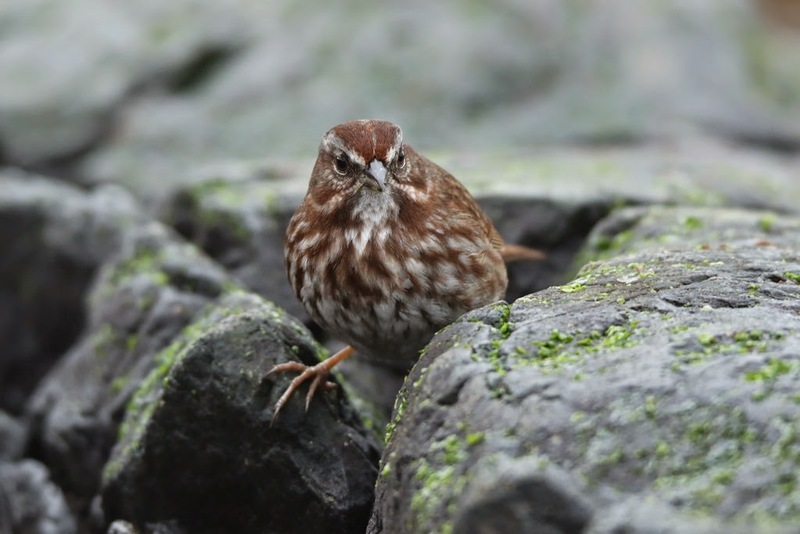 Apparently it is very hard to determine the age between third- and fourth-cycle birds. It has a pretty strong residual tail band, so maybe third-cycle is right. Now that I've bored you with gull musing, the bird itself will be a little anticlimactic. I think it's a nice bird, though. 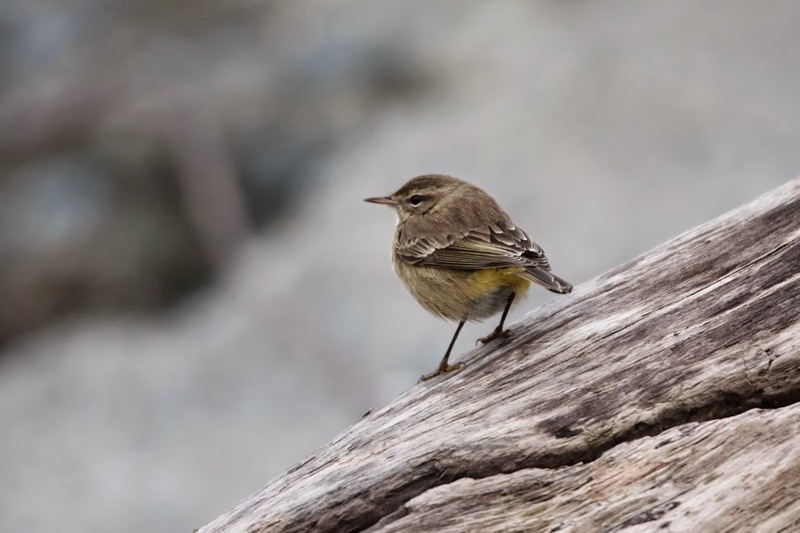 I finished off my afternoon's birding back at Clover Point watching the Palm Warblers. They were quite confiding, but it still required a good deal of patience to get good photo opportunities. I eventually ended up with a handful of respectable shots. I will include a few different angles, including one shot that shows that one of the birds has rufous feathers on the cap indicating it's an adult. What a treat to have them around for over a month! The angled piece of driftwood made for an interesting shot here, I reckon. That's all the material I have for now. I hope to get out again this weekend and will write up another entry if the birds cooperate. Beautiful shots Jeremy and congrats on the new camera. Very nice to see the rufous on the palms head. I hope we get some more redpolls over here this year. 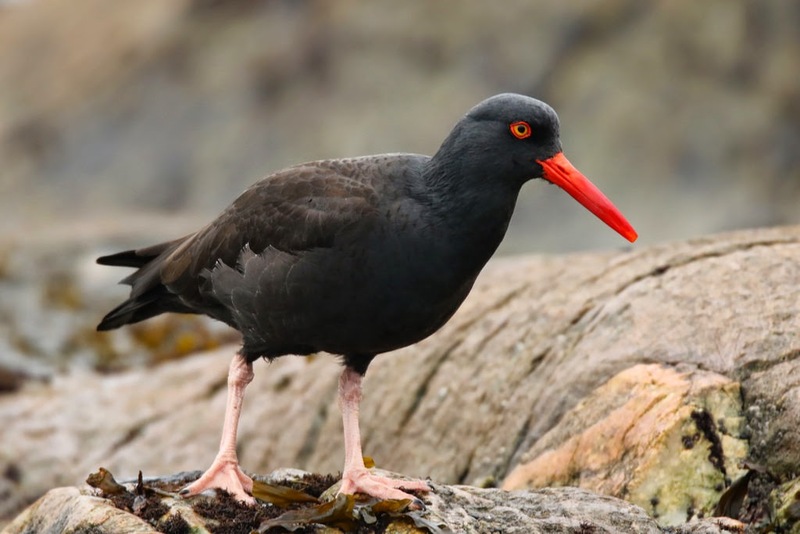 I love that shot of the oystercatcher. cheers and have fun on your upcoming vacation!